In addition to after-school clubs, Grant Middle School students may opt to participate in intramural sports through our enrichment program. We offer special summer enrichment options as well. Basketball season is open to fourth through sixth graders and runs from December through January. Registration begins the first week of November. Coaches schedule practices and assign teams through December before official play begins in January. We play all of our games on Saturdays. Open to fifth and sixth graders, lady basketball runs through September and October. Registration begins the last week of August, with practices starting in September. We play these games on every Saturday in October. Our league includes Grant, Newaygo, Hesperia, Fremont, and White Cloud. 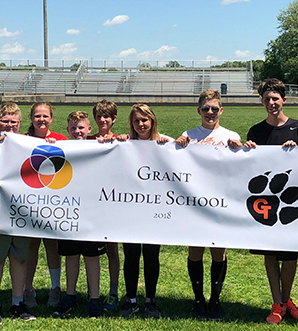 We offer team sport opportunities for all seventh and eighth graders at Grant. Students may participate in football, cross country, basketball, volleyball, wrestling, and track. For scheduling and eligibility information, please visit the Grant Athletics website. All fess marked with an asterisk (*) include the cost of a team jersey or t-shirt. We send all participation forms home with students when registration for each team opens. Additional copies are available in our front office.